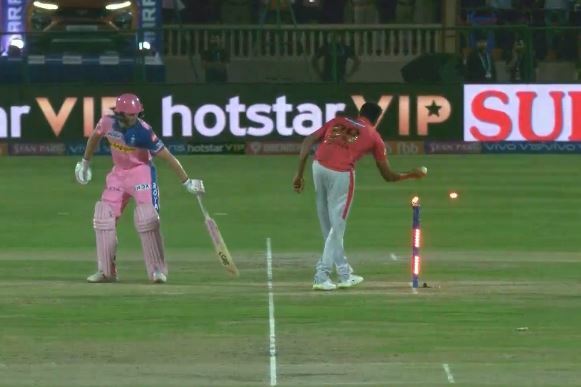 Ravichandran Ashwin sparked massive controversy in the 4th game of IPL 2019. The skipper of Kings XI Punjab Mankaded Jos Buttler during Rajasthan Royals’ chase. In the 13th over of the RR innings, Ashwin was about to deliver the ball as Sanju Samson lined up to face. While the spinner came into his delivery stride, Buttler, at the non-striker’s end, backed up too far. Ashwin spotted that and he removed the bails. The English batsman couldn’t get back in time. The umpire referred the decision to the third umpire but Ashwin and Buttler got engaged in a battle of words. The third-umpire ruled in favor of the fielding side. Buttler was agitated on his way back to the pavilion. He had played brilliantly thus far and was batting on 69 from 43 balls. The opener was guiding RR to the chase of 185 quite comfortably. Ashwin’s move didn’t go down well with a lot of people. Even the on-air commentators were divided on the move. Some believed it was against the spirit of the game. On the other hand, Ashwin was deemed to be right as Mankading is well within the laws of the game. Jos Buttler has been Mankaded by Ravi Ashwin in the IPL. Not the first time it has happened to Buttler. My lip reading isn't perfect but I'm PRETTY sure Jos Buttler said 'Ingenuous move, Ashwin; we should hang out more.' But I guess I COULD be wrong. Well done Ashwin, superbly done! Should get Man of the Match just for that.